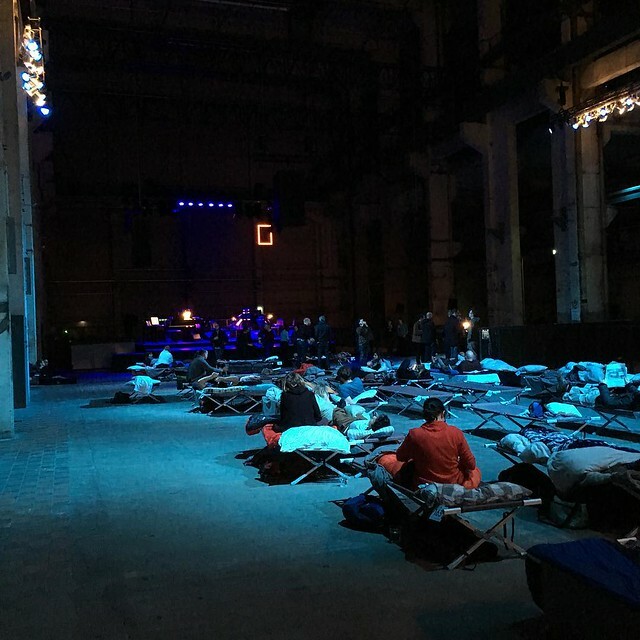 Kevin posted yesterday that he had an extra ticket for Max Richter’s Sleep at Kraftwerk Berlin yesterday. Without a moment’s hesitation I packed my sleeping bag and cycled there with him. Kraftwerk Mitte is a disused power plant in the middle (Mitte) of the city that is now a club venue and host to a variety of events. The most striking features of it are large open spaces and lots of exposed concrete everywhere. Max Richter I didn’t know before but I quickly confirmed that I would agree with his music. It had been one of my desires to attend a classical music concert while lying down being able to doze in and out of sleep as your mind and body dictate. Classical concerts tend to be long and uncomfortable affairs. I hadn’t imagined I would get the chance to do this during an 8 hour overnight concert. The music is very smooth to listen to and it is a kind of music that Richter is known for (read this interview). I’m listening to From Sleep now as I write this. I listened to the first couple of hours and then fell into a fitful sleep until I woke up again at 07:30 to catch the end. Sleeping on stretcher beds at a power station 15 minutes cycling away from home with a couple of hundred other people was a strange experience. It was for one one of the lowest key camping trips I have ever undertaken. Though I’m used to the occasional communal sleeping arrangement, those are totally different situations. Berlin’s club spaces facilitate experiences in between the intimate and transgressive but even then this is an odd one out. I probably also wasn’t the only person in the room who considered it wry that we would pay €48 to sleep in circumstances similar to thousands of others in Germany right now. I’m still not sure what to make of the event but it is a memorable experience that will stay with me for a while like a dream but more powerful.